products and services that keep you "second to none"
You have arrived at the Premier Mortgage, Real Estate and Insurance Internet Marketing Company serving the entire United States. 220 Marketing believes in merging the latest internet technologies with proven marketing tactics. We provide our clients with highly effective marketing plans custom designed to achieve your business objectives. Whether you are trying to sell more houses, close more loans, or write more policies, 220 will help you get to the next level. We have in-house marketing experts that can help your business with everything from free exclusive lead generation to growing your referrals and referral partners. We can also show you how to get more customers from all the free Social Media outlets that are out there for you to take advantage of. No matter how you got here, your marketing plan is about to improve dramatically! 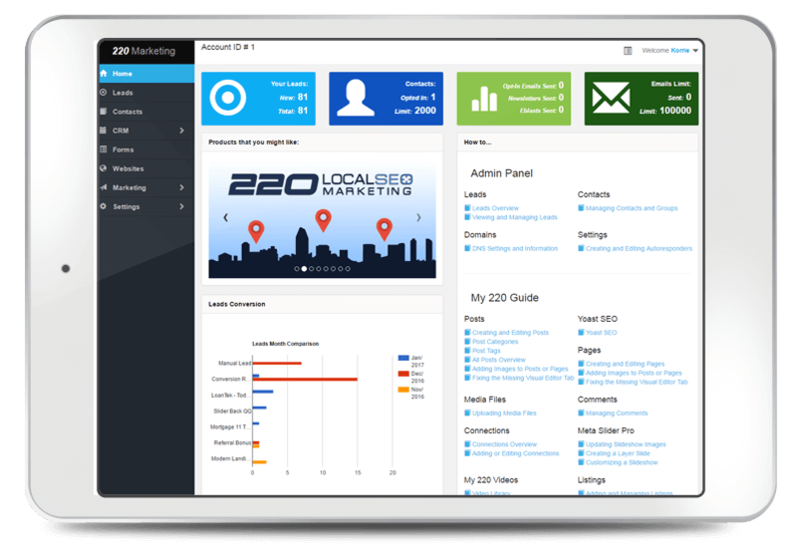 Explore the power of 220 Marketing platform that delivers results that are second to none. 220 Marketing is built on a partnership approach that enables us to create clients for life. 220 Team Members go above and beyond to ensure that every client of 220 is given expert consulting and support to help them achieve their business goals. We are widely known for our service after the sale. Consequently, every year we have been in operation, our client retention rates are among the highest in our industries. We truly believe that our philosophy of "building together" is the key concept to creating long term success for our clients and for 220.